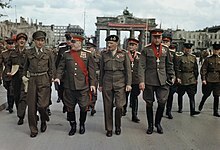 "Allies", "Allied Forces", "Allied Powers", and "Allied" redirect here. For other uses, see Allies (disambiguation), Allied Forces (disambiguation), Allied Powers (disambiguation), and Allied (disambiguation). When spelled with a capital "A", "Allies" usually denotes the countries who fought together against the Central Powers in World War I (the Allies of World War I), or those who fought against the Axis Powers in World War II (the Allies of World War II). The term has also been used by the United States Army to describe the countries that gave assistance to South Vietnam during the Vietnam War. More recently, the term "Allied forces" has also been used to describe the coalition of the Gulf War, as opposed to forces the Multi-National Forces in Iraq which are commonly referred to as "Coalition forces" or, as by the George W. Bush administration, "the coalition of the willing". 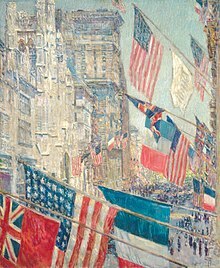 The Allied Powers in World War I (also known as the Entente Powers) were initially the United Kingdom, France, the Russian Empire, Belgium, Serbia, Montenegro and Japan, joined later by Italy, Portugal, Romania, the United States, Greece and Brazil. Some, such as the Russian Empire, withdrew from the war before the armistice due to revolution or defeat. Scholars are divided as to the impact of alliances. Several studies find that defensive alliances deter conflict. One study questions these findings, showing that alliance commitments deterred conflict in the prenuclear era but has no statistically meaningful impact on war in the postnuclear era. Another study finds that while alliance commitments deter conflict between sides with a recent history of conflict, alliances tend to provoke conflicts between states without such a history. A 2000 study in the Journal of Conflict Resolution found that allies fulfill their alliance commitments approximately 75% of the time. Most research suggests that democracies are more reliable allies than non-democracies. A 2004 study did however question whether alliance commitments by democracies are more durable. A 2018 study updated and extended the data from the 2000 Journal of Conflict Resolution study and found that allies only fulfill their commitments about 50% of the time from 1816 to 2003. According to the study, "States honored their alliance commitments 66% of the time prior to 1945 but the compliance rate drops to 22% from 1945 to 2003. Moreover, the rates of fulfillment for defense pacts (41%) and nonaggression pacts (37%) are dramatically lower than offensive alliances (74%) and neutrality agreements (78%)." Map indicating international preferences for principal ally in the case a country were attacked, as of 2017. According to a 2017 poll by WIN/GIA, the United States was the most preferred ally internationally. Russia and China, who preferred one another, both trailed America globally. Four countries, Bulgaria, Greece, Slovenia and Turkey, preferred Russia, despite being members of NATO. In Pakistan, 72% of respondents preferred ties to China, the largest margin of any country surveyed, while 46% of Bangladesh preferred India. A total of 22 countries indicated a preference for the United Kingdom at a rate of 10% or more, but the United States was the only country to prefer the Britain over any other, at a rate of 43%. Five counties preferred France at a rate of 10% or more, led by Belgium at a rate of 25%. A single country, Iraq expressed no preference, while three other countries, Lebanon, Palestine, and Slovenia, expressed no preference at a rate of 11% or more, although at a smaller rate than their preference for Russia on the part of Lebanon and Slovenia, and China on the part of Palestine. Kosovo reported the most unified opinion, preferring the United States at a rate of 92%, while Russia's most unified supporters were Mongolia (71%), Armenia (67%) and Serbia (56%). In total, 21 countries expressed a preference for America at a rate of 50% or more. Results of 2017 poll by WIN/GIA. ^ Larsen, Stanley; Collins, James (1975). Allied Participation in Vietnam. Vietnam Studies. Washington, D.C.: Department of the Army. OCLC 1119579. Retrieved January 15, 2013. ^ Fang, Songying; Johnson, Jesse C.; Leeds, Brett Ashley (2014-10-01). "To Concede or to Resist? The Restraining Effect of Military Alliances". International Organization. 68 (4): 775–809. doi:10.1017/S0020818314000137. ISSN 0020-8183. ^ Leeds, Brett Ashley; Johnson, Jesse C. (2016-11-10). "Theory, Data, and Deterrence: A Response to Kenwick, Vasquez, and Powers". The Journal of Politics. 79: 335–340. doi:10.1086/687285. ISSN 0022-3816. ^ Johnson, Jesse C.; Leeds, Brett Ashley (2011-01-01). "Defense Pacts: A Prescription for Peace?1". Foreign Policy Analysis. 7 (1): 45–65. doi:10.1111/j.1743-8594.2010.00122.x. ISSN 1743-8594. ^ Leeds, Brett Ashley (2003-07-01). "Do Alliances Deter Aggression? The Influence of Military Alliances on the Initiation of Militarized Interstate Disputes". American Journal of Political Science. 47 (3): 427–439. doi:10.1111/1540-5907.00031. ISSN 1540-5907. ^ Kenwick, Michael R.; Vasquez, John A.; Powers, Matthew A. (2015-10-01). "Do Alliances Really Deter?". The Journal of Politics. 77 (4): 943–954. doi:10.1086/681958. ISSN 0022-3816. ^ Kenwick, Michael R.; Vasquez, John A. (2016-11-10). "Defense Pacts and Deterrence: Caveat Emptor". The Journal of Politics. 79: 329–334. doi:10.1086/686700. ISSN 0022-3816. ^ Morrow, James D. (2016-11-10). "When Do Defensive Alliances Provoke Rather than Deter?". The Journal of Politics. 79: 341–345. doi:10.1086/686973. ISSN 0022-3816. ^ Leeds, Brett Ashley (2003-01-01). "Alliance Reliability in Times of War: Explaining State Decisions to Violate Treaties". International Organization. 57 (4): 801–827. doi:10.1017/s0020818303574057. JSTOR 3594847. ^ "Analysis | Allies can't rely on America like they used to. And not just because of Trump". Washington Post. Retrieved 2017-05-31. ^ Gaubatz, Kurt Taylor (1996-01-01). "Democratic states and commitment in international relations". International Organization. 50 (1): 109–139. doi:10.1017/S0020818300001685. ISSN 1531-5088. ^ Leeds, Brett Ashley; Mattes, Michaela; Vogel, Jeremy S. (2009-04-01). "Interests, Institutions, and the Reliability of International Commitments". American Journal of Political Science. 53 (2): 461–476. doi:10.1111/j.1540-5907.2009.00381.x. ISSN 1540-5907. ^ Gartzke, Erik; Gleditsch, Kristian Skrede (2004-10-01). "Why Democracies May Actually Be Less Reliable Allies". American Journal of Political Science. 48 (4): 775–795. doi:10.1111/j.0092-5853.2004.00101.x. ISSN 1540-5907. ^ a b Berkemeier, Molly; Fuhrmann, Matthew (2018). "Reassessing the fulfillment of alliance commitments in war". Research & Politics. 5 (2): 205316801877969. doi:10.1177/2053168018779697. ^ a b c "Four NATO Nations Would Pick Russia to Defend Them If Threatened". Bloomberg.com. 17 February 2017. ^ "42% от българите искат Русия да ги защитава, 17% - САЩ". www.24chasa.bg. Beer, Francis A. (1970). Alliances: Latent War Communities in the Contemporary World. New York: Holt, Rinehart and Winston. Look up Alliance in Wiktionary, the free dictionary. "Alliance" . Encyclopædia Britannica. 1 (11th ed.). 1911. p. 695.